Rawhide is a dangerous treat, given unknowingly by pet parents to their dogs. It is not, as many folks believe, the by-product of the beef industry nor is it made of dehydrated meat. It is actually the by-product of the leather industry. Producing rawhide begins with the splitting of an animal hide, usually from cattle. The top grain is generally tanned and made into leather products, while the inner portion, in its “raw” state, goes to the dogs. Harmful chemicals, glue and paint are added to the product. A brief 4-step explanation below this illustration describes how the actual process transforms the hide to the dangerous chew stick. And, below the explanation, we’ve included some safer, healthier treat option suggestions (vegetarian option as well). STEP 1: Normally, cattle hides are shipped to tanneries for processing. The hides are treated with a chemical bath to help “preserve” the product during transport to help prevent spoilage. Once at the tannery, the hides are soaked and treated with either an ash-lye solution or a highly toxic recipe of sodium sulphide liming. This process will help strip the hair and fat that maybe attached to the hides themselves. The hides are then treated with chemicals that help “puff” the hide, making it easier to split into layers. The outer layer of the hide is used for goods like car seats, clothing, shoes, purses, etc. But, it’s the inner layer that is needed to make the rawhide, and other things like gelatin, cosmetics, and glue. STEP 3: Now it’s time to make these whitened sheets of this “leathery by-product” look delicious. So, here is where the artistic painting process comes in. Basted, smoked, and decoratively tinted products might be any color (or odor) underneath the coating of (often artificial) dyes and flavors. They can even be painted with a coating of titanium oxide to make them appear white and pretty on the pet store shelves. The Material Safety Data Sheet reveals a toxic confection containing the carcinogen FD&C Red 40, along with preservatives like sodium benzoate. Tracking the effects of chemical exposure is nearly impossible when it’s a matter of slow, low-dose poisoning. STEP 4: How does it last forever? Because the FDA does not consider these chews to be food, it’s a free for all when it comes to the manufacturers of these leather strips, and the products they may want to add to these chews, to get them to last forever. Any sort of glue may be added here to help ensure they never come apart. When tested: Lead, arsenic, mercury, chromium salts, formaldehyde, and other toxic chemicals have been detected in raw hides. Healthy, Safer & Delicious Treat Alternatives, as Suggested by THE NEW BARKER dog magazine. Earth Animal No-Hide Chicken Chews – 100% USA-sourced chicken, made in the USA. The chicken has been carefully rolled, cooked and uniquely dried for a one-of-a-kind chew. No hormones or additives. Also available: Beef and Salmon. You’ll find these delicious dog treats at fine Florida dog stores such as Dog Mania & Cats in Dade City. Al CaBONES – We’ve watched customers load up on these treats, as their dogs just love them. The treats are actually beef marrow bones wrapped in chicken. No additives, preservatives or fillers. All goodness, sourced and made in the USA. Bada bing, bada boom. Trust us. This is a treat your dog can’t refuse. Available at fine independent pet retail stores including Fluffy Puppies in Clearwater and Pet Food Warehouse in St. Petersburg. Einstein Pets – What about an alternative for the vegetarian lover? Einstein Pets uses only ingredients that matter. Ingredients like oats, rich in nutrients. Veggie Time dog treats are made with real carrots, turmeric and chia which promotes heart and liver health. This Sarasota, FL company is turning heads in the pet treat industry with awards from Pet Product News and the Best Brand award from American Choice Awards. You’ll find them at fine independent pet retail stores including Wet Noses, Sarasota; Bark Life, Seminole; Downtown Dogs, Tampa’s Hyde Park; The Modern Paws, Tampa; Wag Natural Pet Market, Tampa’s Davis Island; Earthwise Pet Supply in Gainesville, Valrico, Naples and Jacksonville Beach. Finally – always supervise your pet when giving any chew treats. It’s also a good idea to check with your veterinarian, especially if your dog is on a special diet. Sources: Pet nutrition blogger Rodney Habib, Planet Paws, The Whole Dog Journal and The Bark. Author Anna CookePosted on January 9, 2017 January 9, 2017 Categories "The New Barker dog magazine", Dogs, Florida Dogs, Florida's top dog lifestyle magazine., The New Barker dog magazine, The_New_Barker_Dog_Magazine, Treats, UncategorizedTags Dog, Food, healthy dogs, Home, lifestyle, Treats1 Comment on Treat Me Right. One thing we know for sure, dog lovers are a hearty lot, ready to share in their camaraderie and love of dogs. Whether it’s hosting dog-themed parties for friends or fundraising for an animal advocacy cause, it’s a given – the festivities almost always involve food and drink. Many adult beverages are named after a dog breed or are dog-inspired. We thought it would be fun to feature some of them alongside their recipes in our spring issue. Our staging area was the award-winning ulele, located in historic Tampa Heights. It’s the newest restaurant from the Gonzmart family’s Columbia Restaurant Group and features native-inspired foods and spirits. The backdrop, vibe and colors made for some gorgeous photography. While working with ulele Mixologist Chuck Cooper and ulele Head Brewmaster Timothy A. Shackton, we discovered their profound love of dogs. Both men were eager to share stories of how, when and why they adopted their dogs. It became obvious that this was too good to be true, and that we would be returning for a second, more dog-centric photo shoot. 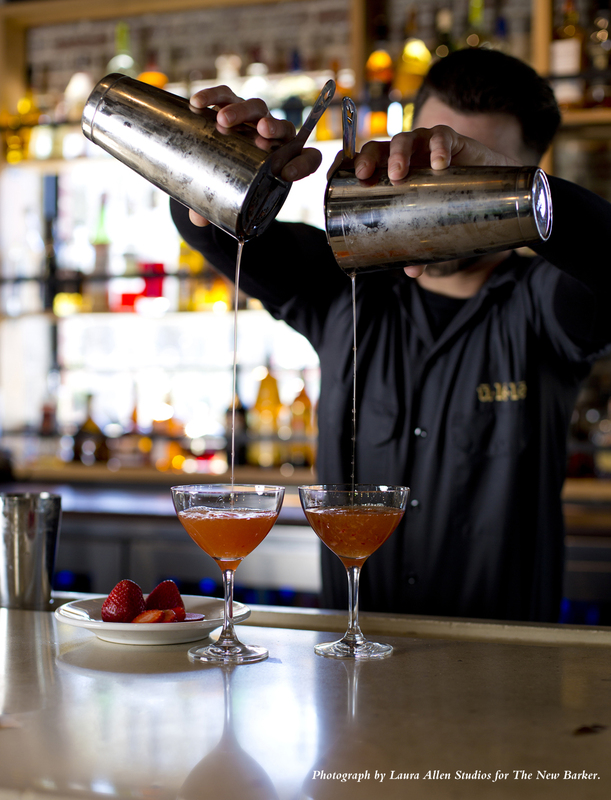 But first – the drink recipes for your summer imbibing. 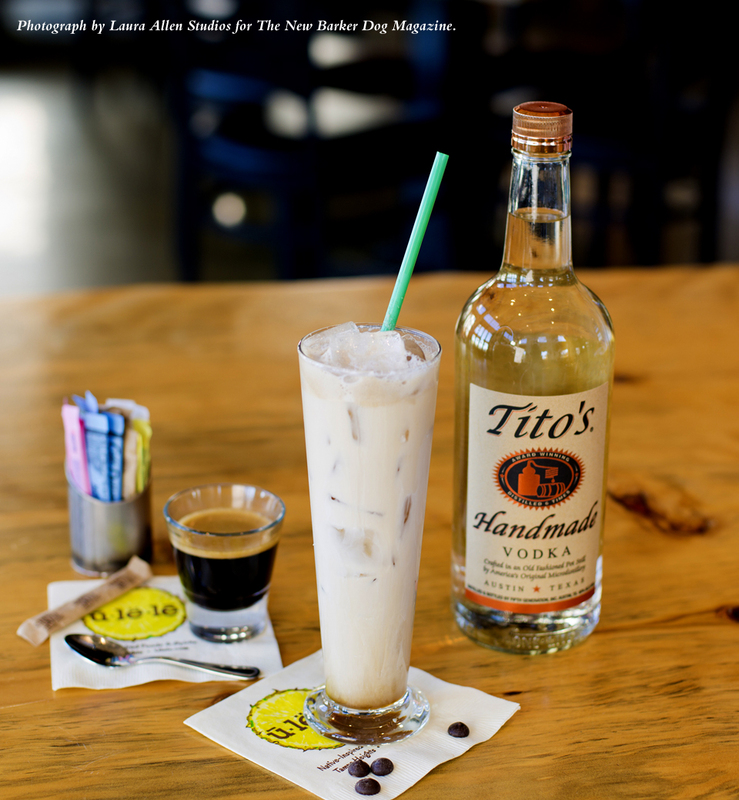 Colorado Bulldog 11/2 ounces Tito’s Vodka 11/2 ounces Kahlua 1 ounce cream or condensed milk Dark cola soda Combine vodka, Kahlua and cream in tin. Shake. Strain over fresh ice into a collins or pilsner glass. Top with fresh cola. Garnish with three chocolate chips and serve with a tall straw. Serves one. Shown with a shot of ulele espresso. Colorado Bulldog. Photograph by Laura Allen Studios for The New Barker. Pomeranian 11/2 ounces white rum (Don Q) 1/2 ounce pomegranate liqueur (Pama) 1/2 ounce triple sec 1/2 ounce fresh squeezed lemon juice 1/4 ounce fresh squeezed grapefruit juice Combine rum, liqueur, triple sec and juices in tin. Shake. 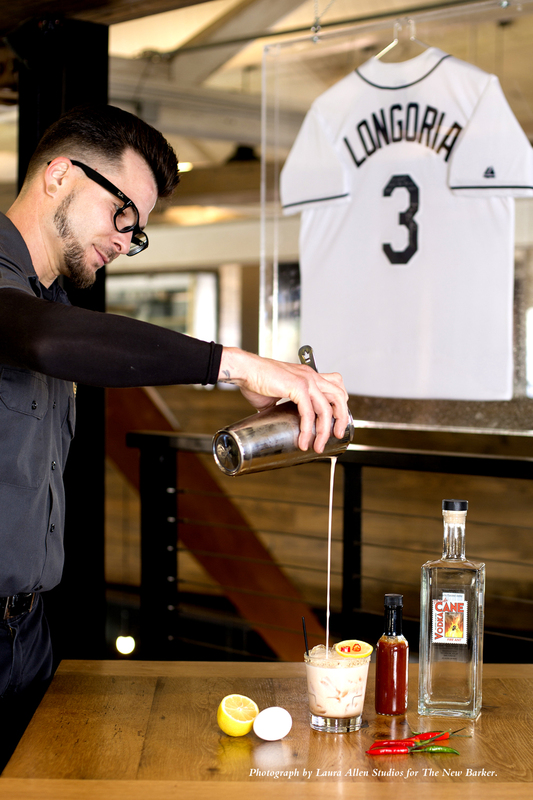 Strain over fresh ice into an old fashioned glass. Garnish with lemon wheel and cocktail straw. Serves one. Salty Chihuahua Wet the rim of an old fashioned glass with lime juice, then dip in crushed pink peppercorn and salt. 11/2 tequila (Patron Anejo) 1/2 ounce grapefruit liqueur (Pamplemousse) 5 to 6 ounces fresh squeezed grapefruit juice Combine tequila, liqueur and juice in tin. Shake. Strain over fresh ice into the peppercorn and salt rimmed old fashioned glass. Garnish with grapefruit wheel. Serves one. 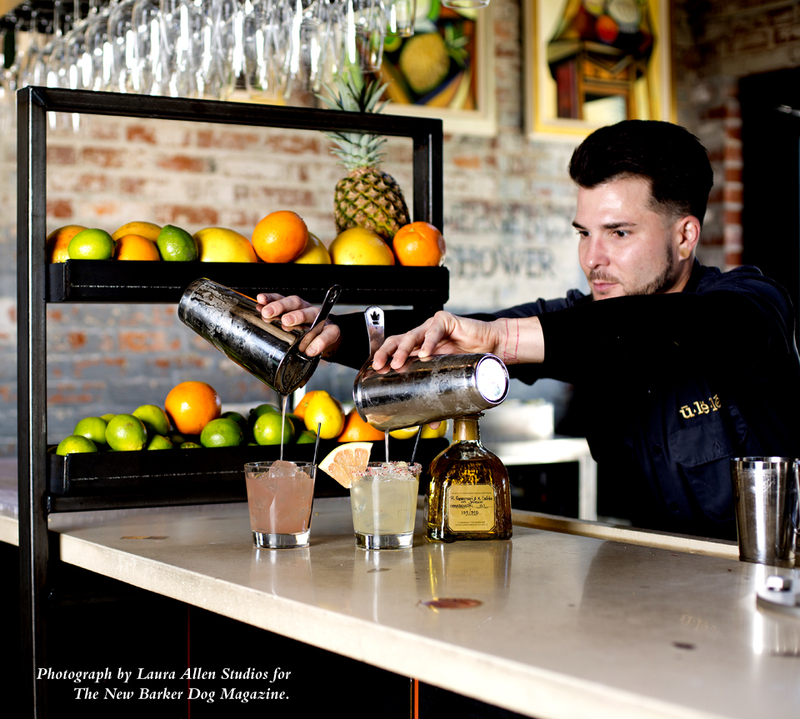 Mixologist Chuck Cooper pours a Pomeranian (left) and a Salty Chihuahua. Hair of the Dog 2 ounces vodka (Cane Fireant) 1 ounce fresh squeezed lemon juice 1 ounce sangrita 1 ounce fresh egg white 1 slice of jalapeño or Thai chili pepper Combine all ingredients in tin. Shake. Strain over fresh ice into an old fashioned glass. Garnish with lemon and chili. Serve with a tall straw. Serves one. “Learning about spirits enhances my need to know. It intrigues me and made me realize I’m a history buff. After work, I go home and read books about booze, then create new drinks.” Mixologist, Chuck Cooper, pouring a Hair Of The Dog. Bloodhound 1 ounce Gin (Nolet’s) 1/3 ounce dry vermouth 1/3 ounce sweet vermouth 1/4 strawberry puree Combine all ingredients in tin with crushed ice. Shake. Strain into coupe glass. Garnish with a slice of strawberry. Serves one. Dog’s Nose 11/2 ounce Absolut Vanilla Vodka 14 ounces Buckhorn Black Nutmeg or cinnamon Add vodka to a 16 ounce chilled pilsner glass. Pour beer over vodka to fill glass. Dust with the freshly grated nutmeg or cinnamon. Serves one. 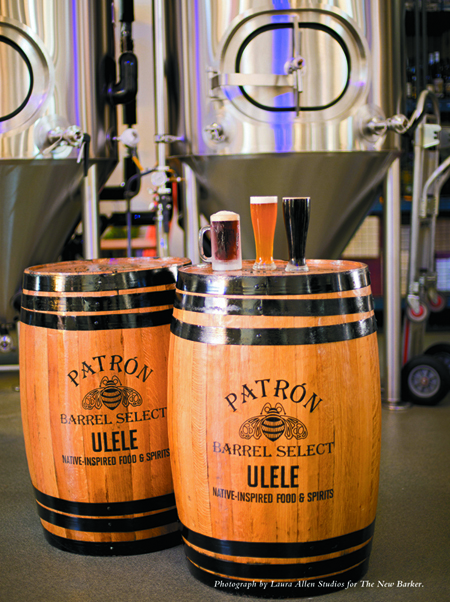 Inside the Ulele Spring Brewery (left to right): Rusty Red, Pirate’s Barrel Lager, Buckhorn Black Lager for Dog’s Nose. The Money Shot, in one take, at the front entry of ulele. Wow. From left to right: Guinevere, Hope, Abby, Bella, Levi, Miss Roux, Peter. Photograph by award-winning photographer, Laura Allen. Author Anna CookePosted on July 31, 2015 July 31, 2015 Categories UncategorizedTags Bloodhound, Bulldog, Chihuahua, Dog, Dog Magazine, Drinks, Florida dog, Florida's top dog lifestyle magazine., Food, fun with dogs., Humane Society of Tampa Bay, Pomeranian, Stories about dogs in Florida, The New Barker, The New Barker dog magazine., Ulele2 Comments on Hair Of The Dog?